1) How well do you feel that PE & physical activity impacts on children’s behaviour, emotional well being & academic achievement? Overwhelming response 98 % stated that they felt it had a big impact on all the above. 2) Can you give examples of how school promotes physical activity, sport & health/well being. 58 % could name 3 or more ways in which school promotes physical activity. 40 % could name 4 or more ways in which school promotes physical activity. 22 % could name 5 or more ways in which school promotes physical activity. Examples given included: fit week, sports day, running track, after school clubs/teams, inter school competitions, external coaches in PE lessons, bike ability, walking bus, outdoor play, active playtimes, use of outdoor space, fun run, celebrating sporting successes in assemblies. 4)How do you feel about the range of extra curricular sporting opportunities at Highfield? 5) How well informed do you feel about the school’s sporting experiences & achievements? 71% felt like they were very well informed about the school’s sporting experiences and achievements making references to the website, assemblies, match reports and the children themselves communicating information to their parents. 6) As a result of your child’s experiences through PE have they taken part in any sport or club outside school? 53% of children have taken part in a sport/club outside of school as a direct result of PE or sporting experiences gained through school. References made to cricket, football, cross country, gymnastics as well as children wanting to go running, do yoga with parents on the back of taking part in such activities in school. It's a hat trick for Highfield. For the third consecutive year we have been awarded the Gold School Games award.This award recognised all the PE and sports offered in school bith during the school day, after school clubs and competitive partcipation. I must thank all the staff for their committment to sport in school and in particular Mrs Barratt and Mr Brassill who co-ordinate sport across the school. Our fabulous Year 6 football team have done the double. They have won the Leeds Inner North League and the Under elevens Falkingham Cup. I watch them play in the final at Garforth Town Football Club last Thursday and was amazed at how well they play together as a team. They payed the game as it is meant to be played and I felt I was watching some international players of the future. The panel was pleased to learn of Highfield's holistic approach to foster pupils' creativity and the way in which the school has used the arts as a vehicle for promoting pupils' emotional well-being through their inspiring and rich arts offer. The school has expertly sought to overcome any barriers on its Artsmark journey by capitalising on the special talents of parents, carers and local community members. In your Case Study, you present excellent evidence of how you are making a difference to, and shaping the opinions of, arts teaching and learning in other schools as a result of the strong partnerships you have developed over your Artsmark journey. The panel looks forward to hearing how you continue to innovate and strive for even better outcomes as you continue on your Artsmark journey. You may also wish to celebrate the children's creative achievements through implementation of the Arts Award scheme. 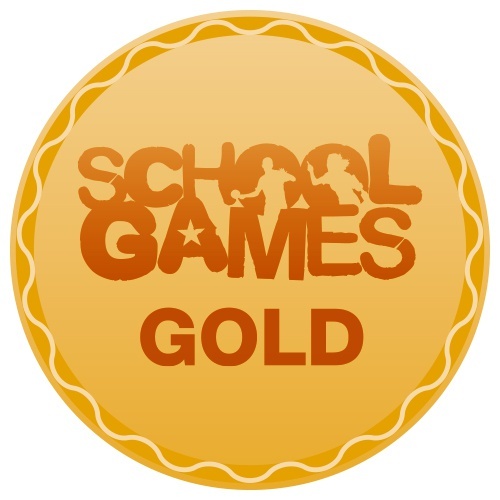 We have achieved the Gold School Games Award for a second year running. This is a government led award scheme which rewards schools for their committment to the development of competition across their school and into the community. We have been awarded the Bronze level for our 2016/17 Travel Plan for the fourth year running. We are striving for silver which requires a significant reduction in the number of families who use a car to come to school. Wow what an amazing Celebration Assembly we have just had with six trophies to show off. On top of our Inclusion Sporting Trophy and girls Cross Country Trophy won earlier this year, we have added four more trophies to our 2017 collection. Our Year 6 girls football team were runners up in this year's Leeds city football tournament. 54 teams took part and it was a nail biting final. Our Year 5 rugby team won this year's under tens rugby league Burton Cup final. Our Year 6 rugby team then won the Burton Cup final for the under elevens. We then won the Culley Sevens Rugby Trophy. A Highfield rugby treble! We really do now need a trophy cabinet. We are delighted to have been awarded the Active Sports Award Gold level. This is in recognition for all the competetive and extra curricular sporting activities offered in school. I have been invited to join a Headteacher's reading and research group who meet regularly to read, discuss and respond to the Cambridge Primary Review Trust's academic research reports into primary education. We have recently discussed the findings of a research paper looking at the social and educational inequality in education. Being part of such a network enables me to use the latest national and international research findings and implications in school to benefit our children. It is also an opportunity to work with headteachers from across the city, sharing good practice and work. To celebrate the 800th anniversary of the sealing of the Magna Carta Highfield was selected to design a flag for parliament to represent East North East constituency. We were selected because of the wonderful work our schoolcouncil does. Fabian Hamilton our MP visited school to see the winning flag design. The winning designers were Sam Rudd and Xavier Rickerby in Year 6. We have been recognised by the Maketon Charity as a Maketon friendy school. Maketon is a sign language used by severalchildren in school to aid their communication. We have also achieved the silver Sainsburies school games mark for our committment to sports. In December 2014 Leeds City Council awarded the school Bronze for its travel plan. This award has been the result of many school initiatives over the last twelve months including our Scooter Training, Road Saftey Training and Bikeability Training. Mr Walsh, Mrs Denton and the school Year 6 Safety Rangers went to the Civic Hall in Leeds to collect the award. I would like to share with you a letter received from Mr Brennan following his visit to Highfield. Thank you for all your hospitality during me visit to your wonderful school last week. I was greatly impressed by the friendliness and maturity of your children by their work and their very positive attitudes. I really enjoyed seeing the butterflies; Elliot, Daisy and Flutterbye being released into the nature area with year 3s. I hope that the castle draw bridges were a success, I am sure they were. However I really must commend the stunning enphasis upon experiential learning, the outdoor curriculum, the very rich experience that you provide for the children and the environment across the whole school is stunning. Foundation subject project work is at a very high standard. Highfield is a very special school with a fabulous ethos and I am sure that you, the staff the children and their families are justifiably very proud of what you have achieved together. Please accept my best wishes for the rest of the term and your future ambitious plans. Our Year 4 Robin Hood's Bay residential receieves an outstanding grading. The Local Educational Authority visited our Year 4 residential to Robin Hood's Bay in October 2012 and placed the trip in the outstanding category. "I visited the group in Pickering close to the castle. All were wearning "high vis" jackets. Travelling on to Whitby, the party had a picnic on West Cliff, an ideal location, and were rewarded with sunshine. The children were taken to and supervised in small groups, to the public toilets close by. Staff then escorted them superbly through Whitby to the James Cook museum. Road crossings were controlled and brisk. Pupil behaviour throughout was excellent, causing little or no inconvenience to the public. The welcome to the centre in Robin Hood's Bay included a comprehensive briefing from the manager and school staff. The school has an established relationship with The Old School House. Staff are extremely experienced in leading residentials at this great venue. Their teamwork was evident throughout the evening meal and beyond. The talk from a "smuggler" was a fantastic learning experience for the pupils (and myself!) Today was a great start to what, I am sure, will be a very successful educational visit.